Margo Carpenter of Hartdale Maps at work in Belfast recently. 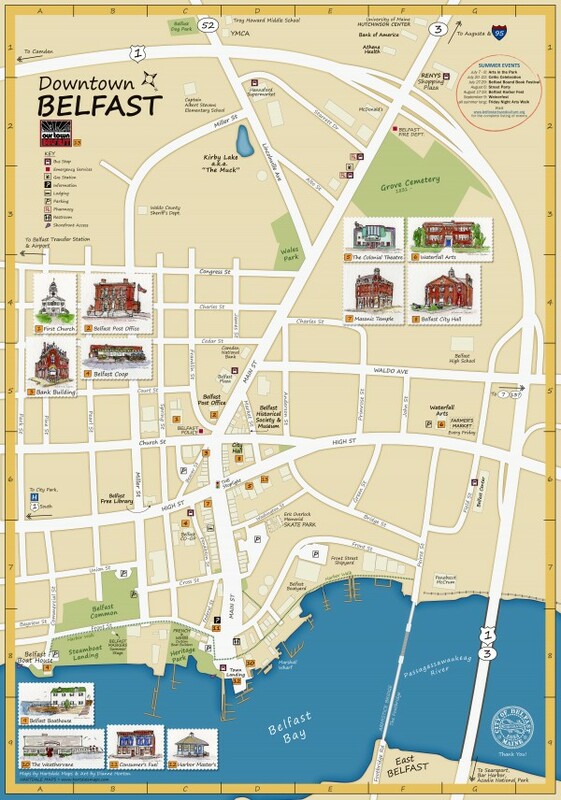 BELFAST, Maine — Visitors who come to Belfast this summer will have a handy new downtown walking map to help them navigate the little city by the bay. It’s cleanly laid out, easy to use and was made by a mapmaker who lives and works in Belfast. 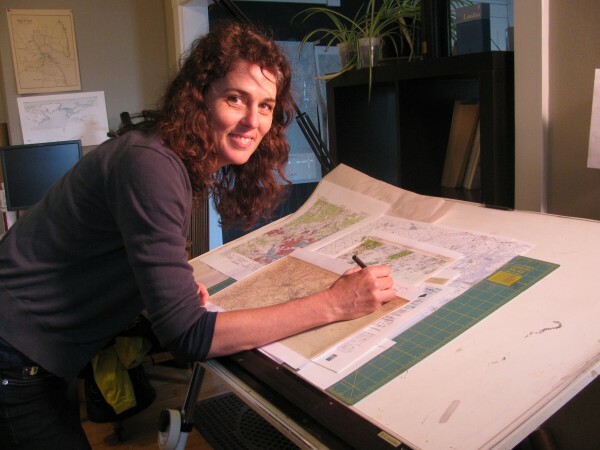 Margot Carpenter has owned Hartdale Maps since 2005, and said that she really likes trying to capture the essence of a place and its people in her creations. Carpenter, originally from the Caribbean island of St. Croix, said she grew up using charts and maps all the time. When she went to college, she studied architecture and environmental design. After graduation, she changed course somewhat to urban planning, Carpenter said. All her experience comes in handy while making her maps. The scale shrinks when making her meticulously-crafted maps. The first step, Carpenter said, is to take existing geographic information system data and work with a client to figure out exactly what the end product should include. That information can include roads, waterways, cemeteries, businesses, geographic contours and much more, she said. She layers the desired information on the page, often making her own symbols to better match the style of the map. “Then I make it pretty,” she said. For the Belfast walking map, commissioned by Our Town Belfast, she worked with local watercolor artist Dianne Horton. The artist painted small, lovely renderings of local landmarks such as the Belfast Co-op and the First Church which were then incorporated into the design. The maps will be distributed at area businesses over the next few months. Carpenter said that over all, her business is doing well, despite the Great Recession. 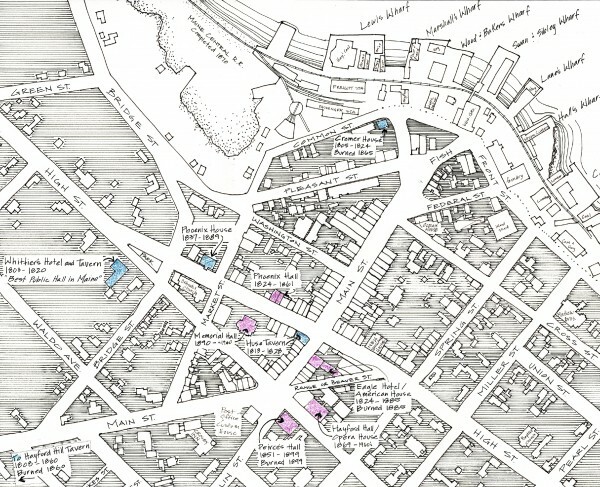 Her clients include the Falcon Guide series, for which she’s created hundreds of small maps. She also has done an artistic rendering of Henry David Thoreau’s travels in Maine for Down East Books and a map of a Vinalhaven estate for a private client. On her own, she has made a large, detailed display map of the Fox Islands and is working on one depicting Casco Bay. One of her most recent and enjoyable finished maps was done for historian Alex Mann, who researches Belfast in the 1800s through dance. Carpenter calls it the “contradancing map,” and spent a long time working to capture the spirit of Belfast in the 1890s on paper. Mann wanted to map the old taverns and halls where contradancing was done. “I loved this,” she said. She looked at old maps at the University of Maine’s Fogler Library in Orono and learned that there were many, many little businesses throughout Belfast’s downtown, including a tailor, grocers and a shipwright. “It is fascinating,” she said.